I am totally amazed at your wonderful service. After spending 2 hours driving around Hobart looking for a cable, I gave up. Decided to check out the internet instead. I placed my order with you around 3.30pm yesterday. The elusive cable was waiting for me at the post office this morning. If ever I or my friends need cables in future, it will be straight to "CableChick". KVM Switch 4-Port + 4 Full Cables Sets + FREE SHIPPING! 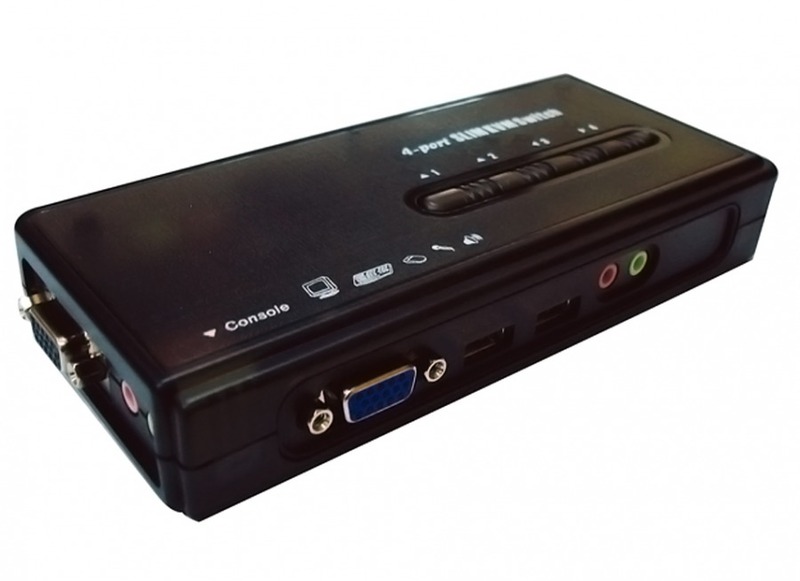 This VGA+USB KVM switch lets you access up to four PCs using the one set of Keyboard/Mouse & Speakers! Once computers get a bit older, they can start to go a bit strange. That’s where the joy of upgrading and maintenance comes in (which is perceived by some as witchcraft) requiring quite a lot of work in regards to backing up, formatting and reinstalling – not to mention ripping out fried video cards and replacing them. All that work has to happen somewhere, and it’s a real burden when you only have one keyboard, mouse and monitor set up. A KVM switch would alleviate that problem, allowing you to hot-swap PCs into and out of an array that can access the same set of peripherals. It would also leave your primary rig always connected and ready to rock at the push of a button! This KVM Switch 4-Port + 4 Full Cable Sets goes even further, with capacity for a whole gang of PCs to share the one desk; without spending real estate on multiple screens! A KVM switch might also come in handy if you’re a super multi-tasker running multiple jobs or projects across several specialised PC systems. And at resolutions up to 1600x1200, you’ll be getting stand-out performance across the board! No more fishbowl CRT spares! You don’t even need to power the unit, as it draws power from the PCs. Also included is 3.5mm stereo audio and microphone switching, so you only need one set of speakers or one headset, too! Share 4 Computers with only one Keyboard, Mouse & Screen. Hot Swap connected PCs for maintenance without powering down the KVM switch or PCs. Very high video quality-up to 1600x1200. Video Bandwidth: 150MHz. The 4-Port KVM Switch a neat little unit for where you want to use more than one PC with a single monitor, keyboard and mouse. The unit is quite small and unobtrusive, and comes with all the cables you need. Connection is a synch, just follow your nose, I didn't even look at the instructions. And it works, like a gem, simple switching between PC's with the flick of a button. I only have 2 PC's running through the switch but it can take up to 4. As an added bonus it doesn't require an additional power source to run, picking up it's power from the keyboard input. Answer: "Yes. Tab or will switch to the next or previous port in sequence." Yes I received the items quickly and in good order. The cigarette lighter adapter (1 x 2.1A, 5V, USB; 1 x 1A, 5V, USB) works a beauty, and the Intellinet 4 port Compact PS/2 KVM switch works a treat. I am a repeat customer.